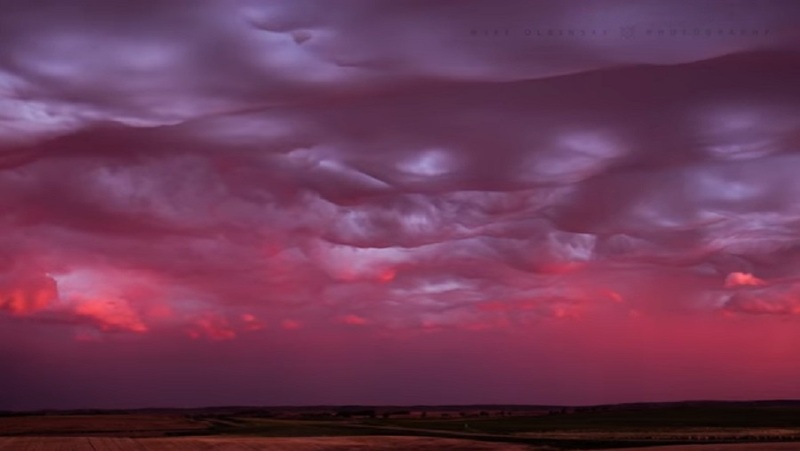 Our current nature-related obsession comes courtesy of storm chaser and filmmaker Mike Olbinski, who recently captured footage of the incredibly rare undulatus asperatus sunset. In layman’s terms, it’s the most gorgeous sky ever, and it truly makes us happy to be alive. Olbinski shot the breathtaking time-lapse video of storm clouds rolling in over the plains of Bowdon, North Dakota on June 2. A rain shaft can be seen in the left portion of the frame just before the sky transforms from a deep blue to a pinkish hue. Gradually, the colorful clouds begin to ripple, or undulate, gravitating towards the center of the storm. An alternate angle of the undulatus asperatus sunset focuses more on the rain shaft, which transforms into a brilliant combination of pink and orange as the light shift begins at the horizon and works its way up into the clouds. Incredible! It’s hard to believe that these ethereal cloud scenes aren’t otherworldly, or sourced from an edited movie scene. Spring skies are known for unleashing terror upon us in the form of severe thunderstorms, electrifying cloud-to-ground lightning and destructive tornadoes, but this fascinating cloud formation time lapse shows us the true beauty in watching meteorological chaos unfold.